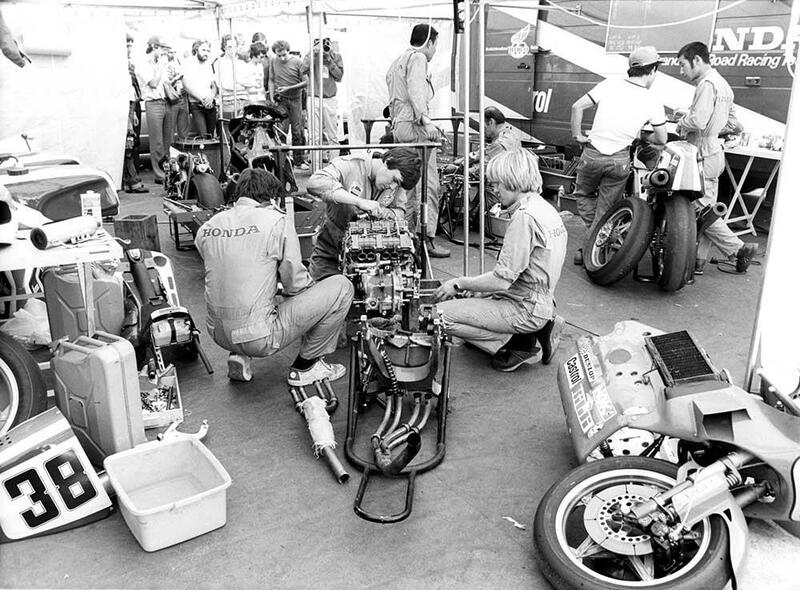 While Barry Sheene fought off Kenny Roberts and Randy Mamola around the Le Mans Bugatti circuit, a group of Honda R&D staff hunched around the world’s two most technically advanced motorcycles in the back of the pits. They radiated frustration. Despite massive effort, Honda’s new four-stroke engineering tour de force had fallen short. It had failed to qualify for the French GP of 1979. It was one of the lowest points so far in the short and massively under-achieving life of the Honda NR500, which earned more unkind nicknames than race victories, and never scored a single World Championship point in two years of intermittent effort before the project was shelved. The great attempt to make a four-stroke that could beat the two-strokes was over. To write the NR500 off as a failure, however, would be to miss the point. The leader of that dispirited group at Le Mans was Takeo Fukui, the engine man was Suguru Kanazawa and the engineer behind the ground-breaking monocoque chassis was Satoru Horiike. Recognise the names? Fukui became president of Honda; Kanazawa became boss of HRC and Horiike worked alongside Kanazawa as MD of HRC. Kanazawa told me: “The NR500 was our teacher,” and the lessons served not only the individual engineers but also Honda’s racing ethos, still evident in the dominant RC213V V4 that has won the MotoGP championship for the last two years in a row. The mission was to make a four-stroke engine capable of matching the power of the dominant two-strokes by revving twice as fast. They would need 20,000rpm or more – unprecedented in an engine that big. The machine was christened NR500 – for New Racer. The initials would spawn epithets such as ‘Never Ready’. 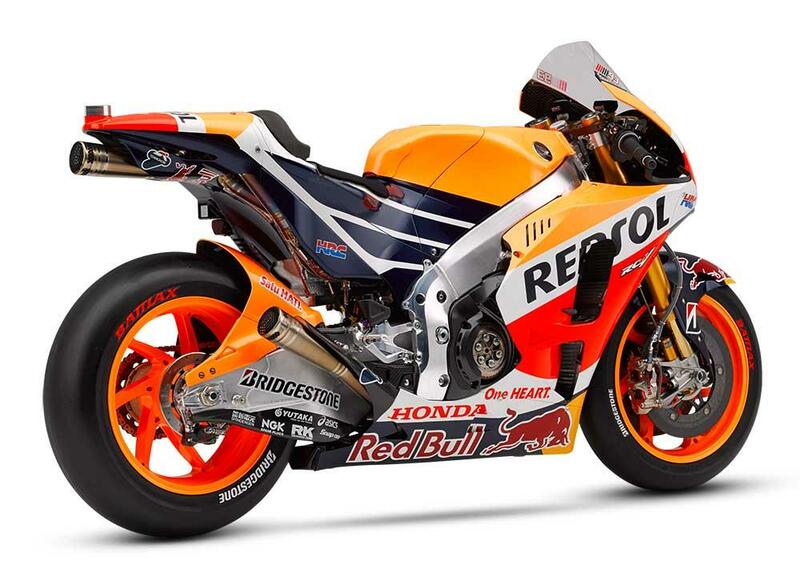 The design was announced early in 1979, and it pioneered carbon brakes, upside-down forks, a rising-rate rear suspension linkage, and the slipper clutch – all common fitments on today’s MotoGP machines. But the most striking innovation was within. The NR500 had oval pistons! Many ideas incorporated in the NR500 had to be discarded. One of the first to go was the monocoque chassis – Horiike’s hobby horse. 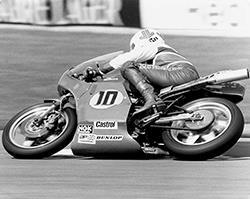 “All racing bikes had a fairing. We used the fairing as a chassis,” he said. The monocoque comprised a pair of aluminium pressings making the fairing sides, joined at the front by the steering head structure, and cradling the engine. Its main advantage was weight: “The first one was very light – maybe half of a steel tube frame,” said Horiike. The disadvantage was engine accessibility: there wasn’t any. Changing the jets required splitting the chassis. “There were 18 bolts from the chassis to the engine. All six millimetre,” he said. It was in this form that the bike appeared in Europe for the first two races, a nightmarish debut that was worse even than people saw. Mechanical fragility was such that Honda had to introduce a night shift – a separate team of mechanics away from the track, working unseen to rebuild the engines, a job that took ten hours. Three weeks later came the debacle in France, and the Honda men withdrew for the winter, battered, but still inspired by the quest. There were many problems to be solved, from reliability to the need for more power.Engine work was of course done in house, and the second version was much improved. It had a slipper clutch to avoid the rear wheel hopping, and Grant remembers that it even idled sweetly at close to 1,000 rpm. Most significantly, the clam-shell monocoque was abandoned, and Honda turned to Britain for a conventional chassis made in steel tubing, built by Ron Williams of Maxton. The cooling system was also conventional – the radiator out front, head-on to the airflow. But they had been shocked at how far away the bike had been from being competitive, and the work took much of the year. It did not reappear until the Finnish GP in July, the sixth of eight rounds. Katayama qualified, but the effort had left them without any race-worthy engines, and he withdrew. He qualified again at Silverstone, and finished last; but gave the project some heart with 12th at the old Nürburgring.The bike had gained power all the time – the inadequate 100bhp of the original up to 110 for only the second race, and to 120 by the end of the next year. In its final form it would just reach 130 bhp, said Horiike – finally meeting the original target. For its last year, it was completely revised again, with the engine canted forward so the front cylinders were close to horizontal. It would be run out of Britain, from the newly formed HIRCO (Honda International Racing Corporation). With the teething troubles behind it, the machine achieved its first race victory in a national event at Suzuka. But although the numbers were right, it was still not truly competitive – the need for revs its downfall. Ironically, the lower-revving two-strokes had more mid-range torque. Katayama struggled on in 1981, however, after 13th in the opening round of the World Championship in Austria. He retired in Germany with brake trouble and crashed on his own leaked water at a baking Paul Ricard in France, before having his best-ever race at Assen, where he was running tenth, in line for the machine’s first World Championship point, when the ignition failed on the final lap.By now, the big decision had been taken by Fukui, who was en route to an increasingly senior managerial role. The project would be stopped at the end of the year because Honda were going to do it the other way, by building a two-stroke. 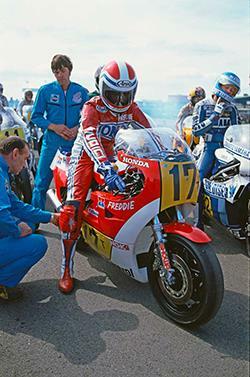 The rest is history, and Freddie Spencer would bring Honda their long-awaited first 500-class World Championship just two years later. The NR500 had some unfinished business though – on the track, and in R&D. After the Suzuka win, Honda’s new discovery Spencer had been given the bike for an international race at Laguna Seca, where he would meet the GP 500s of Mamola and Roberts. Crucially the race began with engines running, eliminating the continuing bugbear of the push start. Spencer won his heat from Roberts, and was leading the final when the engine expired. Spencer was enlisted for the last hurrah in the World Championship, at Silverstone in the British GP. He qualified ninth, and had pushed through to a strong fifth, still gaining on the leaders, when he retired. The common explanation was that he’d achieved the exceptional performance by revving it beyond endurance, but there remained persistent rumours that it had been running only lightly fuelled, for the same sort of early-laps demonstration planned for the machine’s debut at the same track two years before. Either way, it was a raucous finale to its racing career. The other last appearance was as a design piece for a public show, with a skeletal carbon-fibre frame and carbon-carbon brakes front and rear. They had been testing these in cooperation with US aircraft manufacturers McDonnell Douglas, and had used one on the last racer’s rear wheel. Like the turbo-charged 250 that some of the same team went on to develop, this bike would never race, although it did run tests at Suzuka. But the future was two-stroke until the historic decision to reclaim the premier class for the new four-strokes of MotoGP in 2002. 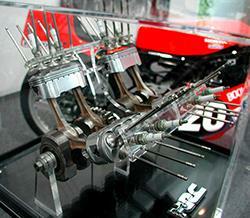 So, to what extent did Honda’s new V5 four-stroke paragon spring from the NR500? It had little in common in detail, but showed the effect of lessons learned in the negative: don’t go racing until the machine is ready, don’t test new technologies up against established technologies, don’t make a machine that is unfriendly to rider and mechanics, and especially don’t disregard everything you and your engineers have learned in the past.